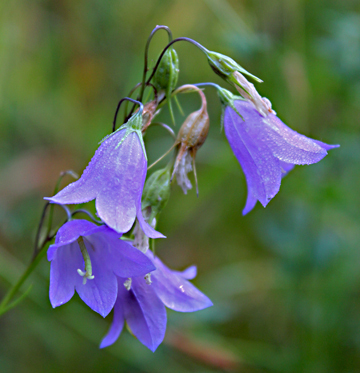 Things are winding down in the Wildflower world, but we found a few to show you yet this week. 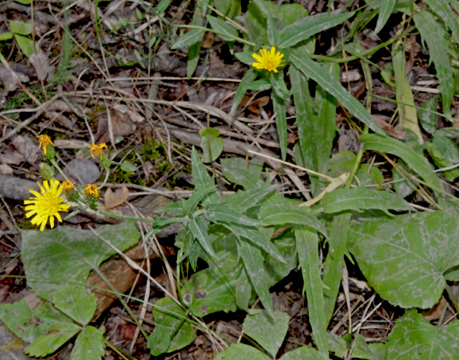 Narrow-leaf Hawkweed – Hieracium umbellatum. You can see the tell-tale leaves in this photo. I know you’ve already seen this flower here, but this picture illustrates its main identifying feature better than the last one we showed you. See the peculiar teeth along the leaf margins? 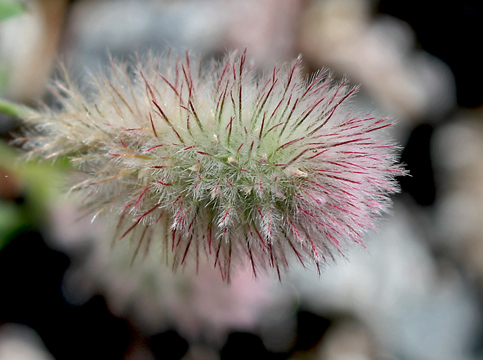 Those are only found on the Narrow-leaf Hawkweed. Generally, thistles have a basal whorl of leaves (like an inverted Christmas tree skirt) as well as smaller leaves growing up the stem. 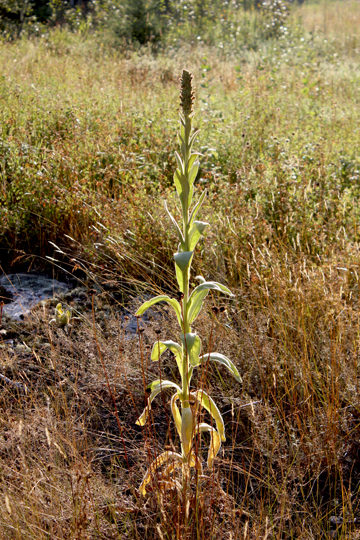 Hawkweeds are missing the basal whorl and are less sturdy looking plants. Fireweed – Epilobium angustifolium, so called because it often grows prolifically in post burn areas. There aren’t as many growing on the ‘Estate’ as usual this year. These beautiful flowers grow up so high that I have trouble seeing them. You can see in the photo on the left that they are as tall as Tansy, even taller sometimes! This one was over a meter high. 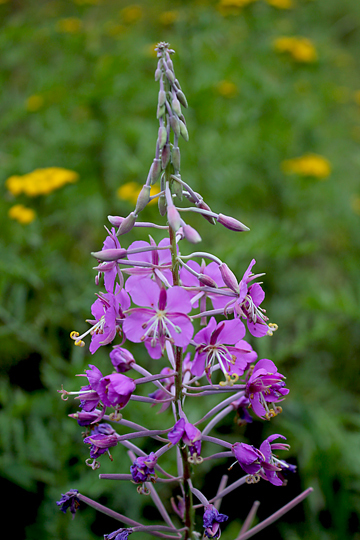 The Fireweed is the territorial flower of The Yukon. It isn’t quite as tall there, Elizabeth says (she’s seen it when she’s been to visit her brother), and the colour is more intense. She says that with such a short growing season up that far north, it needs all the power to attract pollinators it can muster! 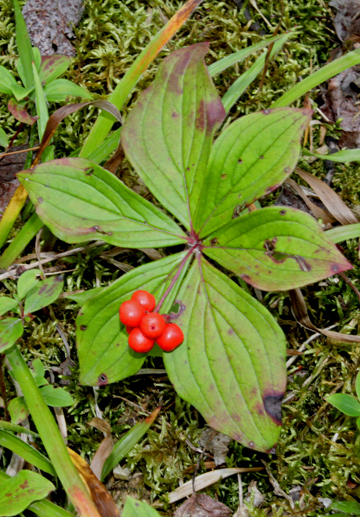 Bunchberry – Cornus canadensis Berries. 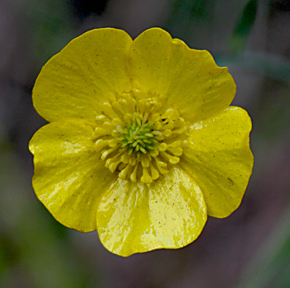 Here is the flower of a Tall Buttercup – Ranunculus acris. Buttercups all have those shiny petals, but if you look closely at the flowers, you can often tell what type of buttercup you are looking at. We’ll show you the different ones next year, perhaps. Already there are frost warnings popping up in the overnight weather forecasts for very near here. Elizabeth is hoping that her garden gets a bit more time for ripening. 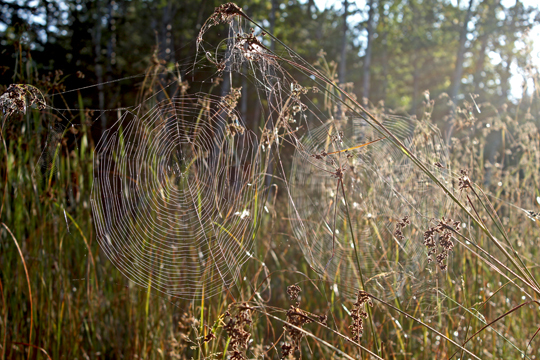 But a frost will put an end to the wildflower season, too. Keep your fingers crossed for us! 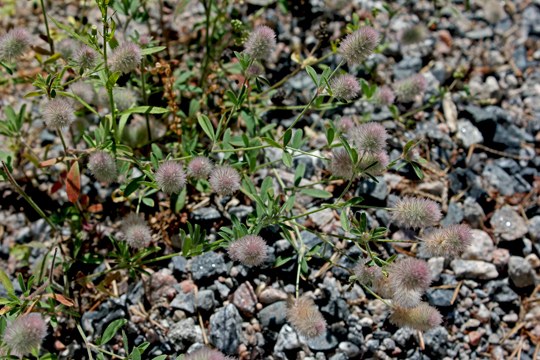 Rabiit-foot Clover – Trifolium arvense. This is growing low to the ground and has narrower leaves than most of the other clovers we’ve found in our area. The flowers are really different, too. They even feel like fur… very soft and fluffy, not unlike Yours Truly! We didn’t get flower photos of this tree for you this year, but the cherries are ripe now. Unfortunately, our trees are too tall and spindly for Elizabeth to gather the fruit. The birds will enjoy fattening up on them, though. 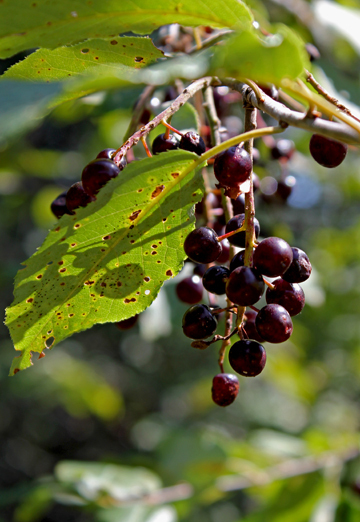 Chokecherry – Prunus virginiana. This fruit makes wonderful jam, jelly or wine but you never want to chew on a handful straight from the tree. They are called Chokecherries for a very good reason: they dry your mouth and throat out almost instantaneously! We found some lovely ones, and some interesting ones for you this week. 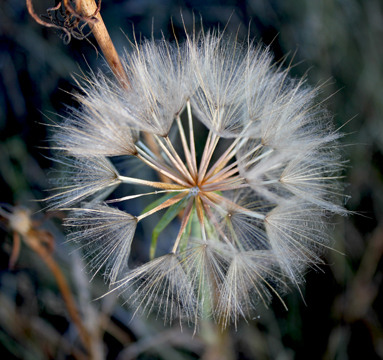 Oh, yes, and one of those blasted composite flowers that look like dandelions but aren’t dandelions at all. As you can see from the flowers, we went out early this morning for our wildflower safari. I wanted to run through the cool, wet plants, but Elizabeth had me on the silly red leash thing and kept telling me to wait while she took pictures. She was having trouble seeing to take the pictures because the lenses of her seeing enhancers kept fogging up. This meant she had to keep taking photos in case the focus wasn’t what it should be. BORING. We found this yellow one down the road from the Harebells. It belongs to the Goldenrod family. We both like these flowers because they indicate that autumn is coming soon. Autumn is Elizabeth’s favourite season. It’s my second favourite. My favourite season is, of course, winter! 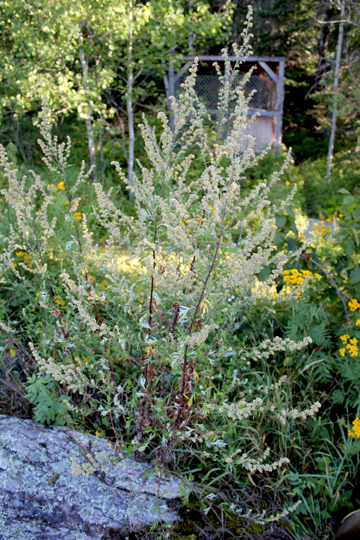 Gray Goldenrod – Solidago nemoralis. 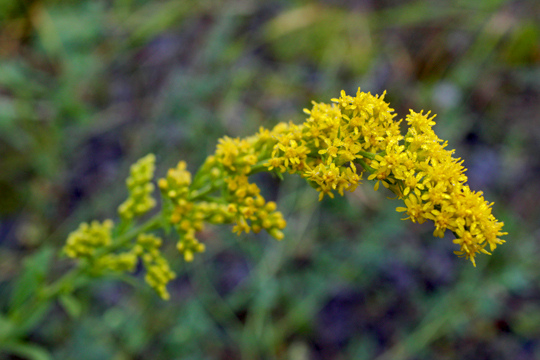 There are almost as many types of Goldenrod growing around here as yellow composite Dandelion imitators. This one is not called Gray because two-leggers have difficulty distinguishing between grey and yellow, but because it’s leaves are a greyish-green colour. You can tell it from the others by this but even better by looking at the flowers. Although there are many little branches of them, they are really short and all the flowers seem to be on the same side of the stem. We headed off road shortly after taking that shot. At last I could feel the dew on my paw pads. Aaaaaah! That’s living! On our way, we saw a number of other signs that autumn is coming soon. If you don’t want to let go of summer, then you’d better close your eyes for this part. The lack of rain over the past couple of weeks has stressed many Paper Birches – Betula papyrifera into thinking it’s time to change colour. We found this Wild Sarsaparilla – Aralia nudicaulis putting on quite a show. I liked lying in the moss while Elizabeth photographed in this spot. 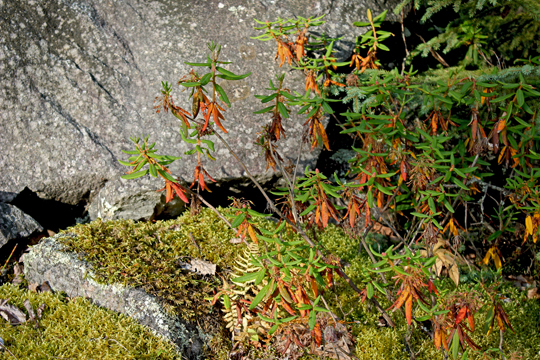 And here is some precocious Labrador Tea – Rhododendron groenlandicum. Okay. You summer two-leggers can open your eyes now. Is it possible to see an echo? Now I’ve seen this next one many times, but I didn’t realise it was actually a flower! 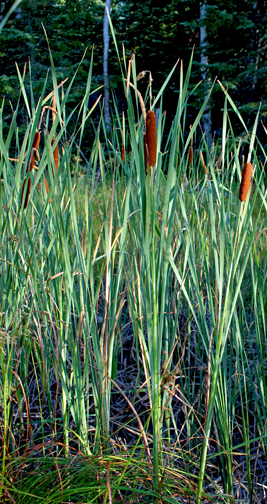 These Narrow-leaved Cattail plants – Typha angustifolia – were as tall as Elizabeth, but she says that under ideal conditions, they can grow to be over 2 m tall! I think they should be called the Narwhal Flower. There is usually a gap above the brown part of the flower, then a ragged looking dead-grass coloured flower part begins. You can see this on some of the flowers in the general photo if you look closely, but the close-up one has lost the upper fluff part for some reason. It is a good time for these to be blooming here from a photographer’s perspective. The water in this marsh has all dried up! Elizabeth was able to walk in without getting her shoes soaked. I kind of missed the splash part of our safari, though. 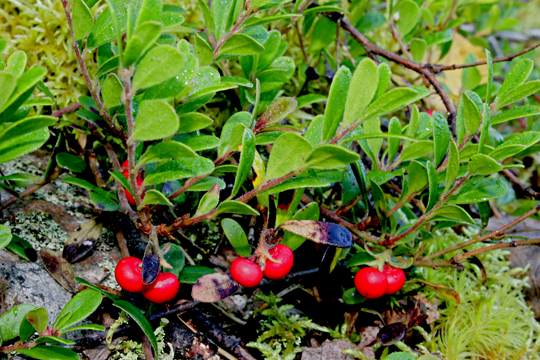 I don’t know if Bears actually eat Bearberries – Arctostaphylos uva-ursi…. I think, judging from what they leave behind, that they prefer Blueberries, which are much tastier. Some plants look lovely in the early morning light. We found this lonely, faded Common Mullein – Verbascum Thapsus watching the sunrise, too. Isn’t it lovely? It’s almost as tall as the Cattails. 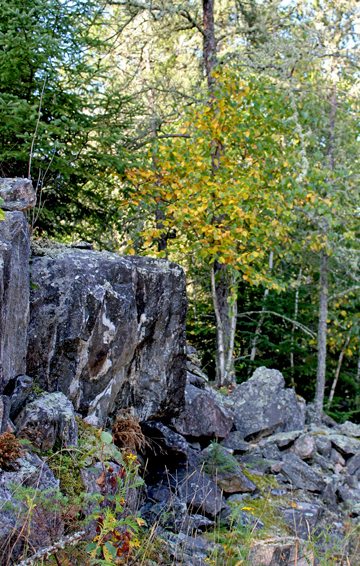 From here we turned onto a deer path that led into the deep woods. We didn’t expect to see much there today; we were just taking a short-cut to the road, where it is easier for Elizabeth to walk me on the silly leash. To our surprise, we found something Elizabeth recognised, but hadn’t found on the ‘Estate’ before. Now, if you thought those Cattails made strange flowers, wait ’til you see this one! 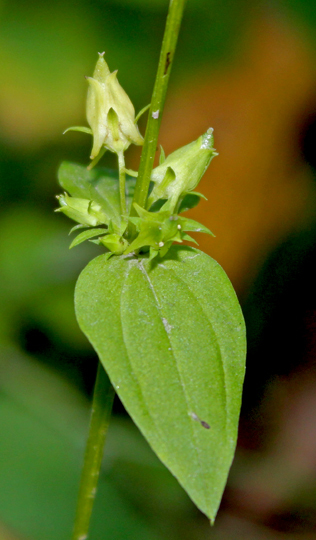 The flowers of the Spurred Gentian – Halenia deflexa are very small and easy to miss. But aren’t they just the coolest little flowers you ever sniffed out? Next to it, we found one of those Dandelion wannabes, but Elizabeth needs to think about it a bit before we show you a photo. Maybe next week, she says. 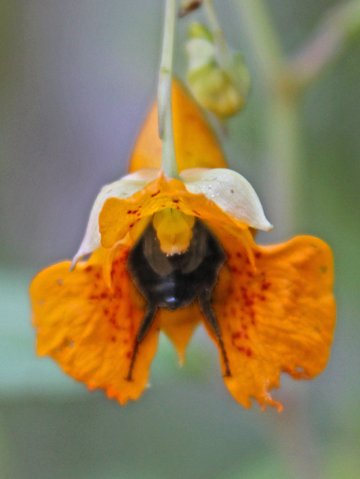 We showed you a Jewelweed flower last week. This morning, however, we found one that was more intensely coloured. And there was no wind here, so I think Elizabeth was able to get a better photo for you to look at. Elizabeth has been busy atoning all morning in the kitchen which has, apparently, been renamed: THE DOGHOUSE! 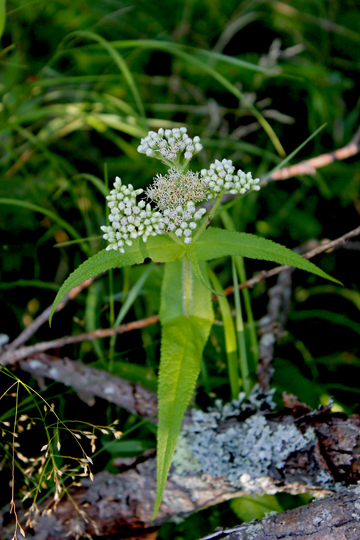 This is really a very interesting plant for those who spend time in the woods here. Not all of our plants are two-legger friendly. We showed you one called Stinging Nettle the other day. It can give you a nasty rash if it touches your bare skin. 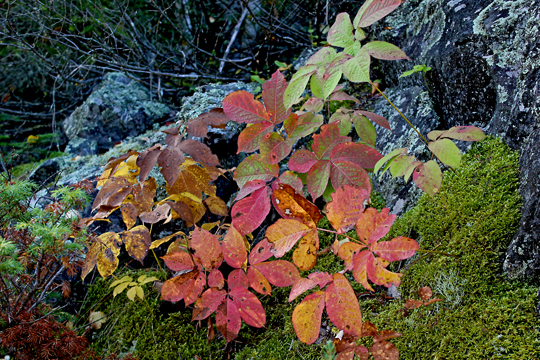 This is Poison Ivy – Toxicodendron rydbergii. Don’t ever touch it. Even the latin name says it’s poisonous! There is another plant that two-leggers here learn to watch out for very early in their lives because it can cause blisters when it touches skin. If those blisters break, and they most likely will because they itch so badly that two-leggers can’t resist scratching them, they release a liquid that spreads the rash. 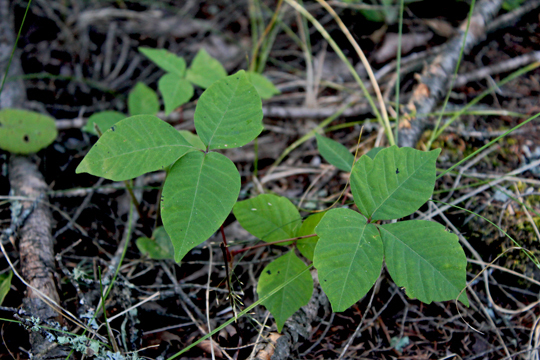 Two-leggers can sometimes end up in hospital in agony and exhaustion once they’ve come into contact with Poison Ivy. It’s so noxious that some people can even pick up a rash from stroking the fur of a pet that has walked through it. In our attempts to get a flower close-up, we got mooned by a bee. 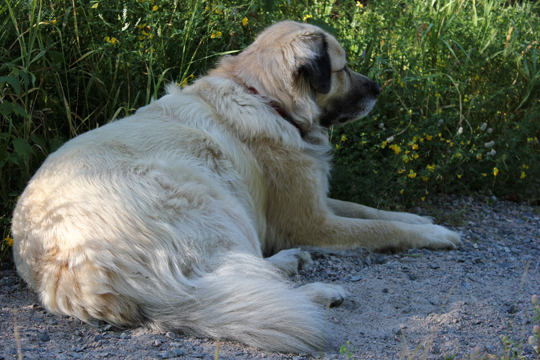 Two-legger vets often prescribe calamine lotion to be applied to the area of the rash. Elizabeth has only had Poison Ivy once, and she knows from experience that calamine really doesn’t help that much. 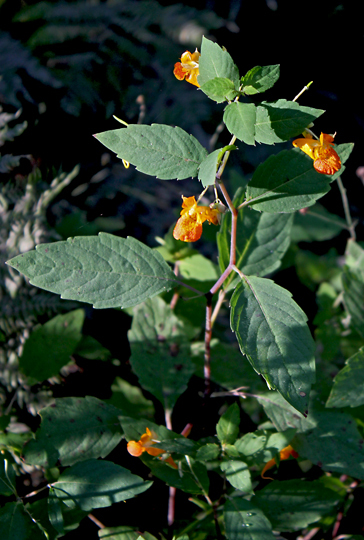 She didn’t know about Jewelweed back then, so she can’t say if it’s any more effective but she’s heard that it is. One day she’s going to try using it on a rash. The whole plant can be used; it’s quite succulent. She’s been told to throw it into a blender and puree it, then spread it over the affected area. It’s also said to be very good on insect bites. 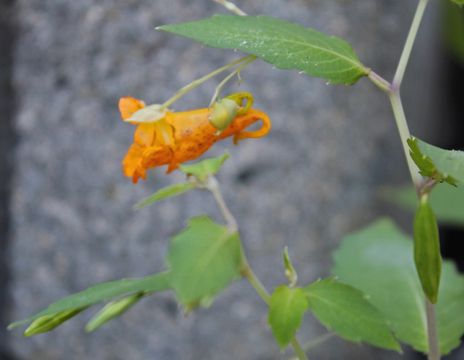 Jewelweed likes to grow in moist soil. It’s easy to identify by its beautiful flowers, so take note of it and familiarise yourself with what the plant looks like. It isn’t always in bloom when you may need it! We found some other medicinal plants today, too. 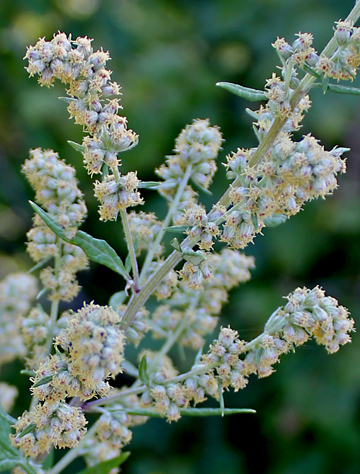 Mugwort – Artemisia vulgaris is a herb that was brought over to North America by Europeans. It’s just considered a weed now. It has rather strange flowers, too, not unlike the Field Sagewort we showed you last week. On the edge of the woods we found an interesting composite flower. 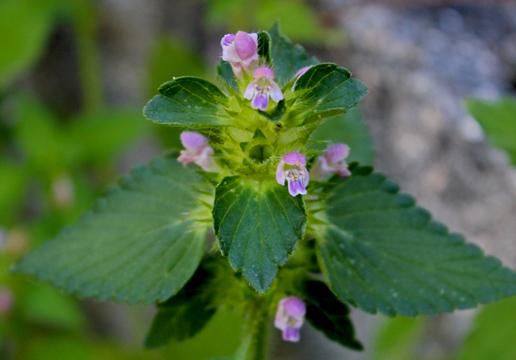 This plant was thought to aid the setting and healing of broken bones, hence it’s common name. Many of the flowers we’ve shown you before have gone to seed now. Some of them look rather beautiful in this state. 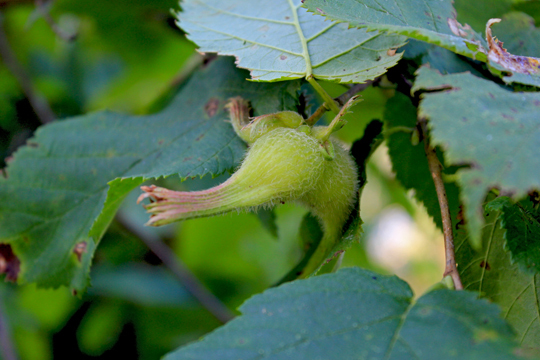 We didn’t start this series early enough to get a photo of this shrub’s flowers, but today we found some nuts growing! The squirrels always seem to get these before Elizabeth does. She’s going to go out today and pick all the Beaked Hazel Nuts – Corylus cornuta she can find. They will ripen after they are picked. If you would like to try picking them, be sure to don a pair of good gardening gloves first. Those hairs on the bract covering the nuts are more like bristles, and they come off easily in two-legger skin. Ouch! 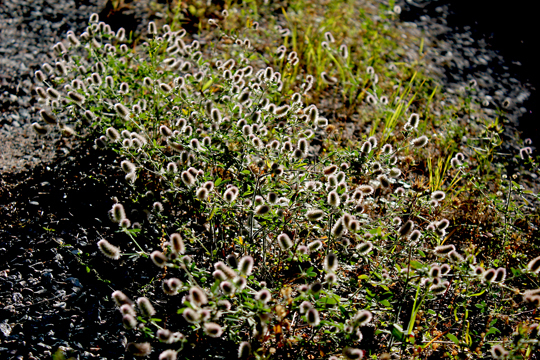 Rabbit-foot Clover – Trifolium arvense is a new flower for us. Elizabeth thought it was a grass until she looked at it closely to see the tell-tale clover leaves on it. They are much narrower than on the other clovers we find here, though. We’ll go out and try getting some good flower close-ups for next week. She just loved the way the early morning light hit these! Just as we finished getting this photograph, Kay called us in for breakfast. Too bad. I’d just found a really nice spot to wait while Elizabeth took our photos!